PINELLAS PARK, Fla., Jan. 31, 2017 – As employees of all ages continue to use digital devices more than ever, harmful blue light protection remains a hot topic. 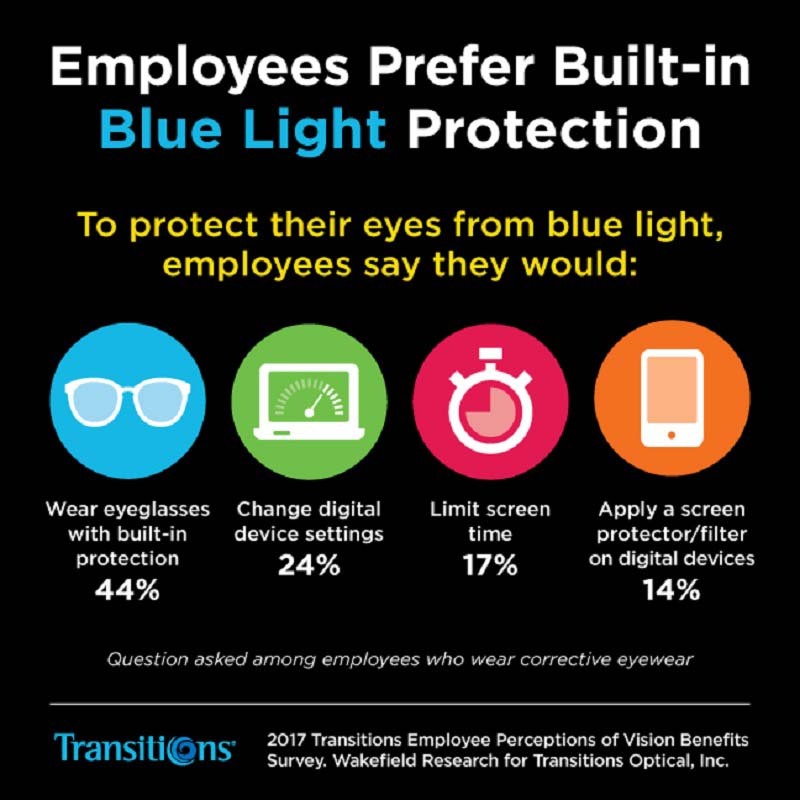 New findings from Transitions Optical, Inc.’s 2017 Employee Perceptions of Vision Benefits surveyi, conducted by Wakefield Research, unearth the generational differences seen in blue light attitudes and habits, reinforcing the need for increased education and protection. The research reveals that harmful blue light protection is valued across generations, but is less top-of-mind for Baby Boomers.ii Millennials are the most likely to say it is important that their prescription glasses have blue light protection—with 83 percent agreeing, compared to 75 percent of Boomers. Despite this consistent interest in harmful blue light protection, all generations are at least somewhat confused about whether their eyewear delivers on what they want. 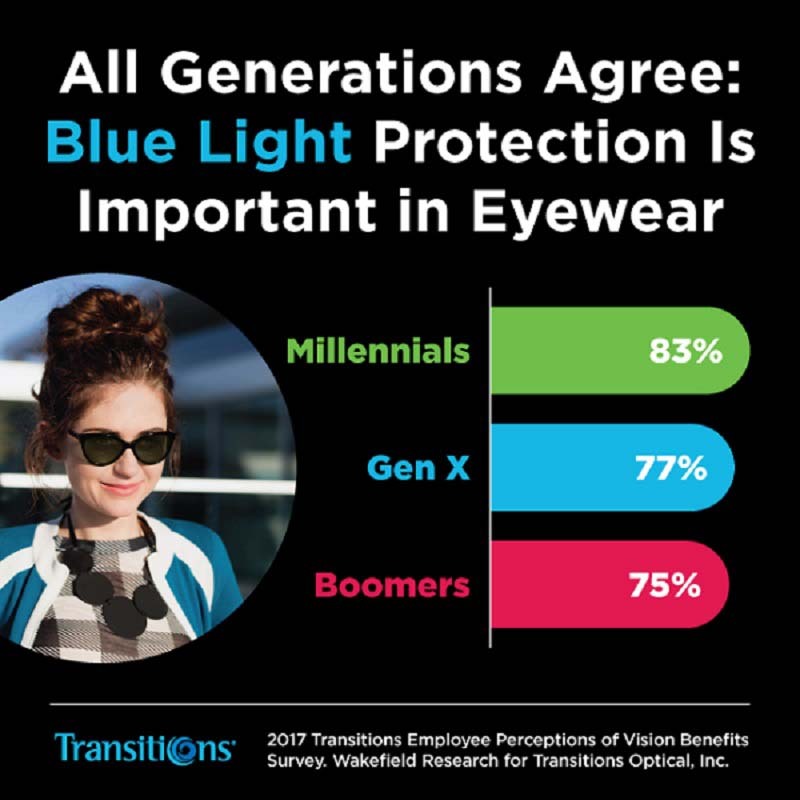 Among employees who wear eyeglasses, one-fourth of Millennials and 37 percent of Boomers say they are not sure whether their current lenses have blue light protection. Confusion also extends to the sources blue light, as confirmed in the 2016 Transitions Optical survey,iii in which less than one in five employees (19 percent of Millennials and 15 percent of Boomers) identified the sun as a source of blue light. Blue light is found everywhere—from the device screens that are a part of everyday life to the sun, the largest source of blue light. Long-term exposure to harmful blue light has been linked to increased risk of developing age-related macular degeneration (AMD)iv. 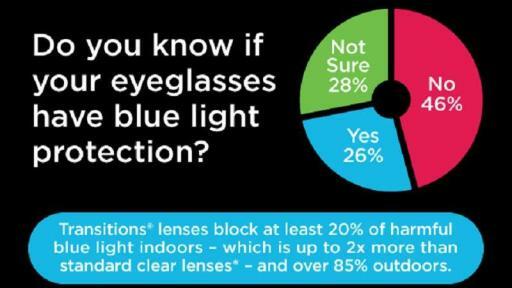 This is the leading cause of vision loss in adults over the age of 50v, making harmful blue light protection an important consideration for all generations, and Baby Boomers in particular. Recent research released by The Vision Council reinforces the high usage of digital devices across generations—with nine out of 10 Americans using digital devices for more than two hours a day, and more than half using two devices at the same time. While digital device use is higher among those under 40, the gap is not very large—91 percent of people ages 18 to 39 state they use digital devices for more than two hours a day, versus 79 percent of those 60 and up. According to the report, less than one-third of those surveyed had discussed digital device use with their eyecare provider. 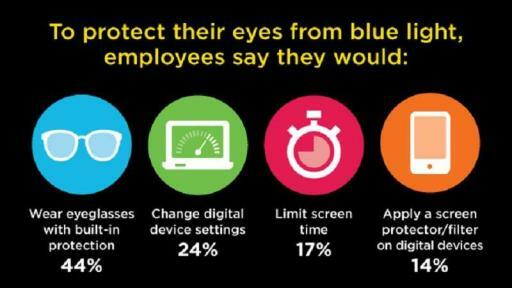 The 2017 Employee Perceptions of Vision Benefits survey found that wearing prescription glasses that have built-in blue light protection is the solution employees are most likely to use to protect against harmful blue light (44 percent), versus taking other steps, such as changing settings on digital devices (24 percent) or limiting screen time (17 percent). Furthermore, the Baby Boomer generation is most likely to turn to their eyewear for protection (55 percent) versus Millennials (38 percent), yet they are the least likely to think they have it in their lenses. In the 2017 survey, 41 percent of Millennials and 49 percent of Boomers said they do not have protection in their lenses. Many vision plans cover options that protect from harmful blue light. Transitions® lenses, for example, have always filtered harmful blue light and block 100 percent of ultraviolet (UV) radiation. Indoors, the lenses filter harmful blue light emitted by artificial sources, such as digital devices and LED lights. Outdoors, the lenses darken to help provide even more protection from harmful blue light, intense glare and UV rays from the sun. However, many people are not aware of this product benefit, making education by vision plans, benefits brokers and employers important to ensure members realize the value of their coverage and take advantage. 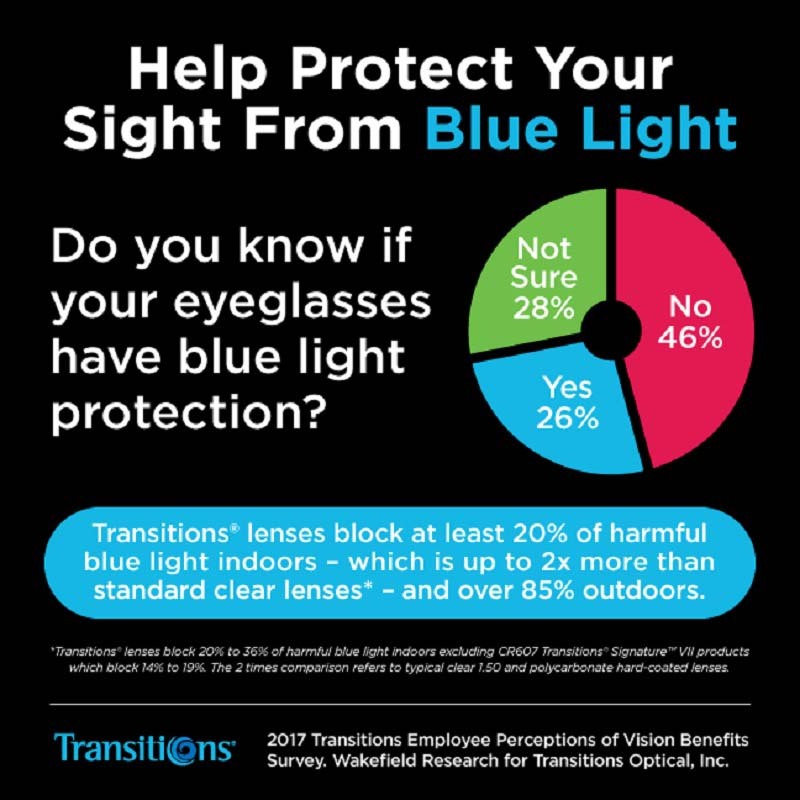 To help elevate the importance of eye exams and quality eyewear available through a vision benefit, Transitions Optical offers a variety of employee and employer focused tools and education. These can be accessed free of charge through the Transitions Healthy Sight Working for You® public education program. Transitions Healthy Sight Working for You® is a public education initiative established by Transitions Optical, Inc. to raise awareness of the value of quality vision benefits. Reaching employers, benefits brokers and employees, the program outreach focuses on ways that comprehensive vision care and the right eyewear options can help to manage health care costs and increase productivity. Complimentary vision savings calculators and other employee education materials are available through HealthySightWorkingforYou.org. NOTE: For high resolution images, please contact Brian Ackermann at brian.ackerman@havas.com or 412-477-4312.
i Online survey conducted by Wakefield Research on behalf of Transitions Optical, Inc. in December 2016 among 1,002 nationally representative U.S. adults, ages 18+, employed full- or part-time, whose employers offer vision benefits. 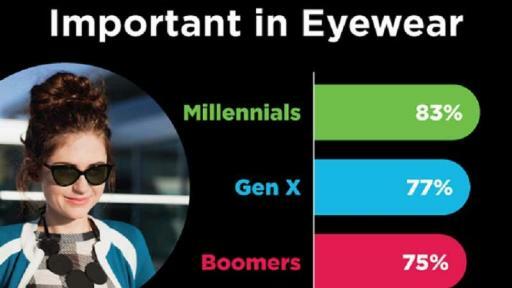 ii For the purposes of the 2017 Employee Perceptions of Vision Benefits survey, Millennial adults are defined as ages 18 to 35, Gen X as 36 to 51, and Boomers as 52 to 70.
iii Online survey conducted by Wakefield Research on behalf of Transitions Optical, Inc. in November 2015 among 1,000 nationally representative U.S. adults, ages 18+, employed full- or part-time, whose employers offer vision benefits. iv Arnault E. Barrau C, Nanteau C. Gondouin P, Bigot K, et al. “Phototoxic Action Spectrum on a Retinal Pigment Epithelium Model of Age-Related Macular Degeneration. Exposed to Sunlight Normalized Conditions.” PLoS ONE 8(*); e71398.doi:10.1371398. August 23, 2013.
v National Institutes of Health National Eye Institute. Facts about Age-Related Macular Degeneration. Retrieved from: https://nei.nih.gov/health/maculardegen/armd_facts.